I did not see this coming, though I am fully aware of the unemployment rate, high prices, low salaries, lack of freedom of speech and corruption that has been flowing in the veins of the Sultanate. 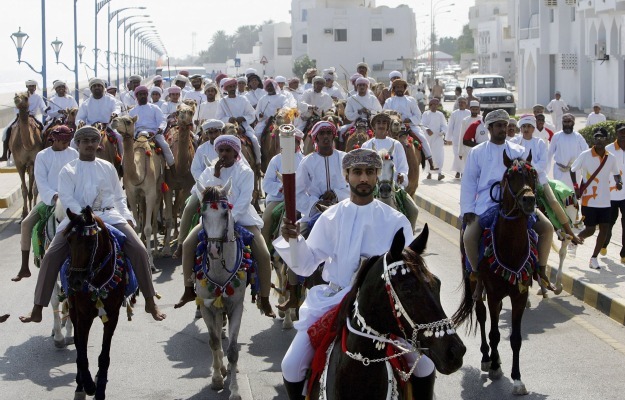 Omani people have watched the uprisings in the Arab world, and they have learned a valuable lesson from the Tunisian and Egyptian revolutions. The power of the people is so great that it can change the unbearable reality. According to the Oman News Agency, what happened yesterday and what is happening today all over Oman is a type of ‘vandalism’ though the protestors were chanting: “selmeyyah” (peaceful protests) all the time. Let’s start from the very beginning. About 300 protestors gathered on Saturday in the Globe roundabout in Suhar, or what is known now as the ‘Reform Square’, to demand more political and economic reforms. This comes after the decrees issued by the Sultan and which did not meet the protestors’ demands for change. The result was that the police arrested 41 people to spread fear among the others. Of course that did not happen. The protestors were more determined to continue with their peaceful protests. From our anonymous eyes and ears in Tripoli. Right after Friday prayers, people started to leave the mosque which is a two-minute walk from my building. I could hear that gunfire had already started in another area before the people finished their prayers. As the peaceful protestors left the mosque, they started to chant: La Ellaha Ela ALLAH, Qaddafi Adouaa Allah – “There is no god but God, Qaddafi is the enemy of God”. The moment I saw that scene I was so happy, proud, and speechless! The gunfire in my area, and in Souk Jomaa, Mayzaran, Siyahiya, Dahra and elsewhere, was random and didn’t stop until around 5 pm. I am in Tripoli, on the 24th February at 1pm. As I heard in the news this morning that Zawiya city is under attack, I called my friend in Zawiya to check. He confirmed to me that Zawiya city has been under ruthless and continuous attack since last night at around 2am. He also reported that around 8am there was very heavy gunfire and the sound of exploding bombs. He told me he was terrified because the gunfire didn’t stop the whole night. (An eye witness told al-Jazeera that at least 100 people have been killed in Zawiya this morning). Minutes after my call with my friend, I received confirmed news that Misurata is under attack too by the so-called security forces, and a little girl along with many other injured people were brought to Misurata hospital. At 2am I hear gunfire and screaming coming from far. 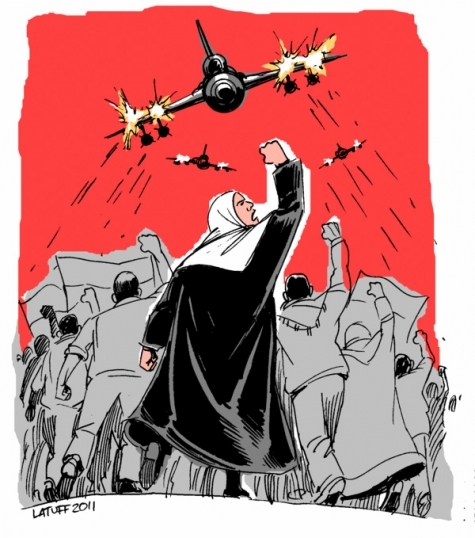 Hours later, I heard that a woman was randomly shot by ‘security forces’ while she was standing by her window in an area called Zawiyat Adahmani, which is near the area of Ben Ashour, where I live. Last night there were big celebrations around the streets and mainly in Green Square by the thug’s supporters (when 2 days ago almost 1000 martyrs were brutally killed). Following his threatening speech, anyone who walks in the streets of Tripoli by night will be cleared (killed) right away- exactly as he said. 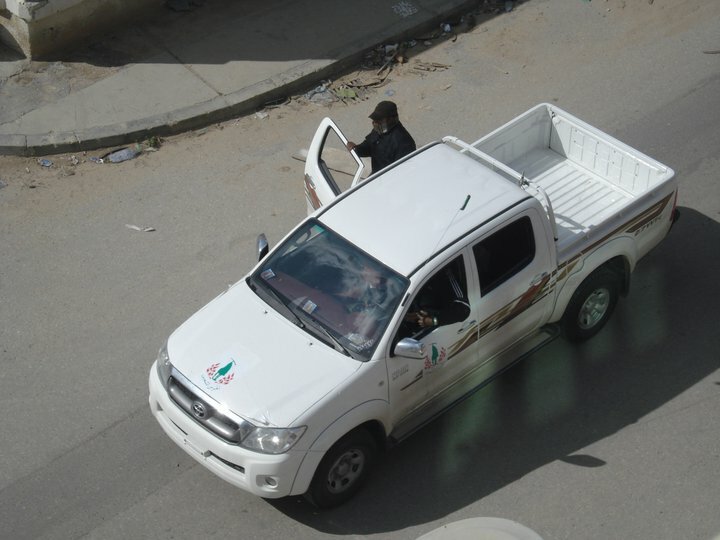 Right after the celebrations, non-Libyan mercenaries and some black Libyans (from the south) belonging to ‘kitaib khamis‘ (the Khamis Qaddafi Brigade) were spread all around Tripoli (there is a video taken proves mercenaries driving around the area of Fashloom- at least 8 open cars). Our informant in Tripoli, last I heard, was at home, terrified, trying her best to remain calm amid the sound of heavy gunfire. Tripoli is very hotly contested. 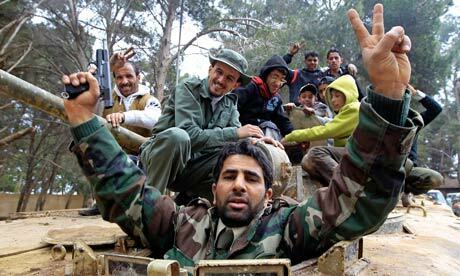 Reports suggest eastern Libya, meanwhile, has become an anarchist’s paradise. Benghazi, Tobruk, al-Bayda and smaller towns and villages are in the hands of the people and revolutionary soldiers. Committees have been formed for neighbourhood protection, rubbish collection and traffic direction. The mood is peaceful, triumphant and fearless. Two war planes have been landed in Benghazi by pilots who refuse to bomb the people. Another crashed outside the city after its pilots parachuted out. Today the city of Misurata, in the west, has also been liberated. 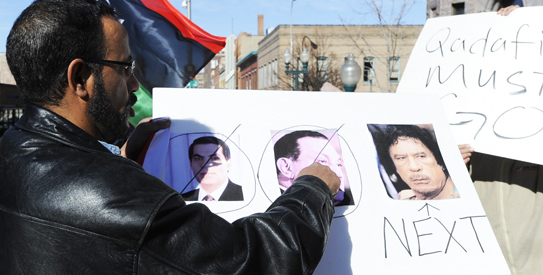 Qaddafi’s regime has already collapsed. The army in Misurata, and in the Jebel al-Akhdar region, has joined the people. A statement by high-ranking officers asks all military personnel to head to Tripoli to remove Qaddafi. The Interior Minister and the Justice Minister have resigned, as have many diplomats. 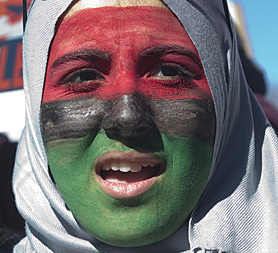 All prominent Libyan tribal and religious leaders have backed the revolution. At least a quarter of the country’s oil output has halted; a tribal leader in the east threatened to stop supplies to Europe if Qaddafi continued to kill – and indeed the pipeline to Italy is now dry. Our friend in Tripoli reports. A new morning with more horrific news. Yesterday in Benghazi Qaddafi henchmen fired at mourners of the dead – and during the burial services of more than 80 martyrs – with machine guns. The families burying their beloved heroes were all shot in the cemetery – الله أكبر (Allahu akbar!) Qaddafi is taking out his lunatic rage against the people of Libya! Benghazi confirmed the death of 200 in one hospital. There is no question now it was a massacre in Libya. And this morning, the heroes of Benghazi are burying more than 216 martyrs. Reports are informing me that the total death toll is over 400 by now. Last night in Tripoli, they released many prisoners of ‘’Jdayda’’ (most of them are criminals or illegal/homeless immigrants from different African countries) to terrorize people, attack protestors and steal houses. They kept only prisoners that belong to ward 9 (which contains the most deadly dangerous criminals). Gaddafi also released the female section of the prison and now Tripoli city is filled with thugs and criminals everywhere and it has become unsafe to go out alone. 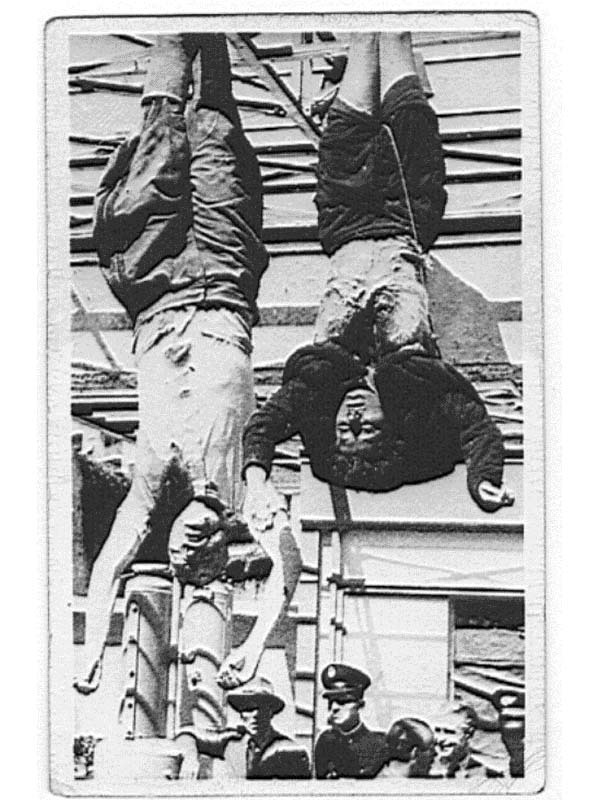 It’s obvious that Qaddafi wants the fall of the people (a play on The People Want The Fall of the Regime).